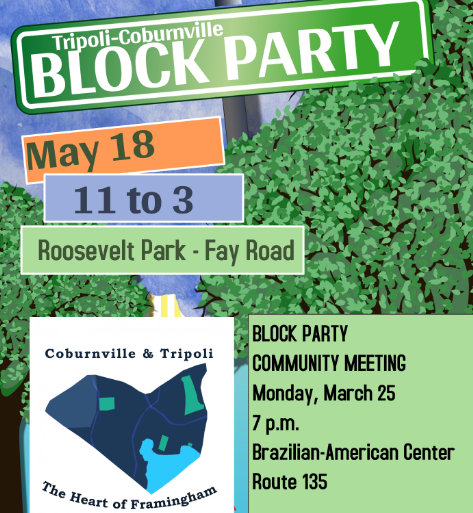 FRAMINGHAM – A meeting is scheduled for Monday, March 25 at the Brazilian American Center (BRACE) to help plan a block party for the Coburnville-Tripoli neighborhoods. The meeting starts at 7 p.m. in the BRACE library. All from the two neighborhoods are invited. The block party is scheduled for Saturday, May 18 at Roosevelt Park on Fay Road. A permit has already been filed with Framingham Parks & Recreation by the organizing committee. 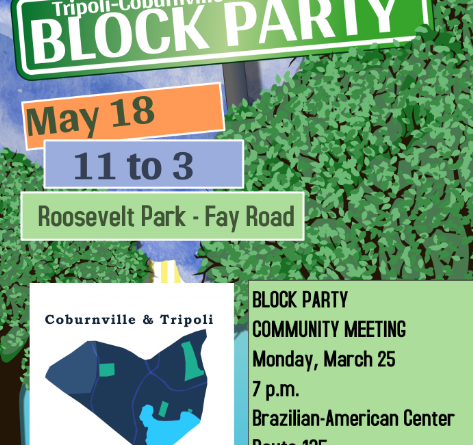 The meeting is to discuss the details of the block party, get input from the neighborhood, and to discuss the launch of a neighborhood association for the Coburnville-Tripoli neighborhood. Just likes there is a Pheasant Hill group, a Nobscot Neighbors, and a Friends of Saxonville association, the residents are looking to create a neighborhood association and not a political District 8 committee.